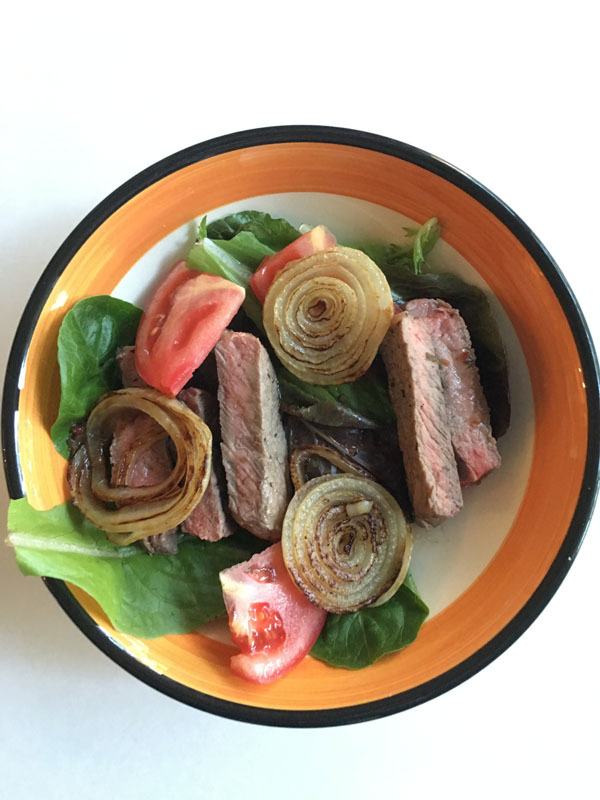 This Sirloin Steak and Tomato Salad is super easy to make and is packed with lots of flavor and protein. I know most of us try hard to keep a healthy lifestyle but after a while it can become monotonous. I am hoping with the heighten grill element that this dish will have you running from the boring salads and give you a happy, full feeling. Enjoy! Brush onion slices with 1 tbs of vinaigrette and sauté until translucent and slightly caramelized. You may also grill the onions slices if you choose. About 13-15 minutes. Rub chili powder lightly onto the steak and sprinkle with salt, pepper and a drizzle of olive oil. Place steak in the center of the grill on medium heat. Cook until desired temperature. Allow to rest for a minute on a cutting board. Cut the steak into thin slices and then separate the onions into rings. Toss salad greens with remaining vinaigrette and top with steak, onions and tomatoes. Season with salt and pepper as needed.